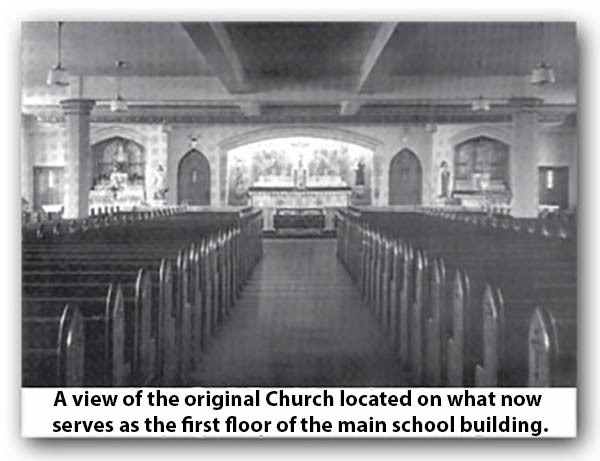 The parish was founded on April 11, 1928, at the direction of Cardinal Dennis Dougherty with the purchase of a tract of farmland bound by Vista Street to the north, Shelmire Avenue to the south, Large Street to the east, and Caster Avenue to the south. The purchase price was $60,000. The farmland belonged to three families: the Fields, the Fishers, and the Roberts. The Roberts’ land had been granted to the family by William Penn, and included a Revolution-era farm house that was located on what would eventually become the corner of Caster Avenue and Faunce Street. The Roberts farm house remained a fixture in the neighborhood until demolished in the 1950s. Cardinal Dougherty appointed Rev. John M. Crosson as the first pastor. One hundred and ten families were reassigned from three existing parishes in the area: St. Cecilia, Maternity of the Blessed Virgin Mary, and St. Martin of Tours. 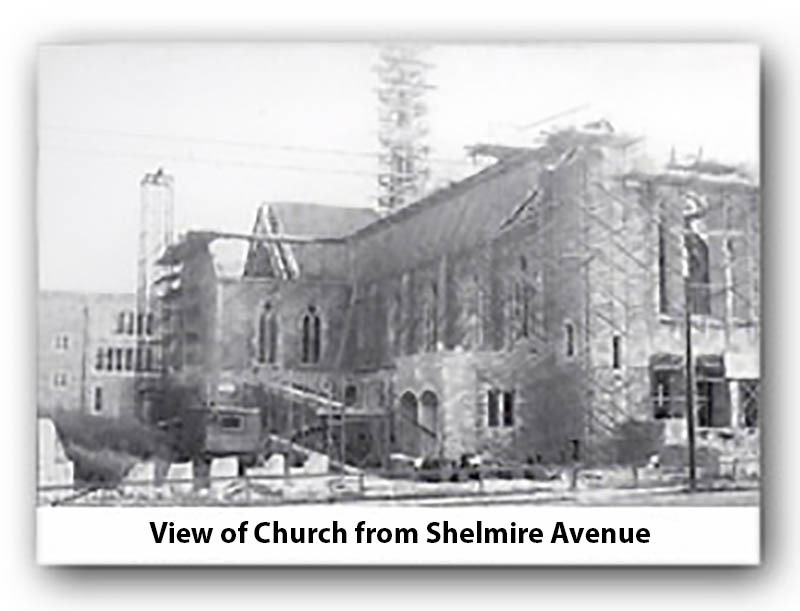 Construction began on a three-story, gray limestone building that would become Resurrection of Our Lord Church and School in late 1928. The structure consisted of three classrooms, a chapel, and an auditorium with stage at a final cost of $271,000. The building’s corner stone was blessed by Cardinal Dougherty on April 24, 1929. The school opened its doors on September 3, 1929, with a faculty of four Sisters of St. Joseph, each of whom was responsible for teaching two grades. On October 11, 1931, the Rev. William J. Casey succeeded Father Crosson as pastor for a brief time until Rev. 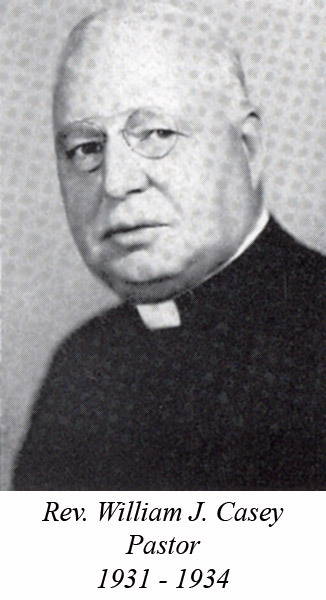 Thomas J. Ryan was appointed as pastor on September 16, 1934. By this time the parish has grown to more than 250 families. 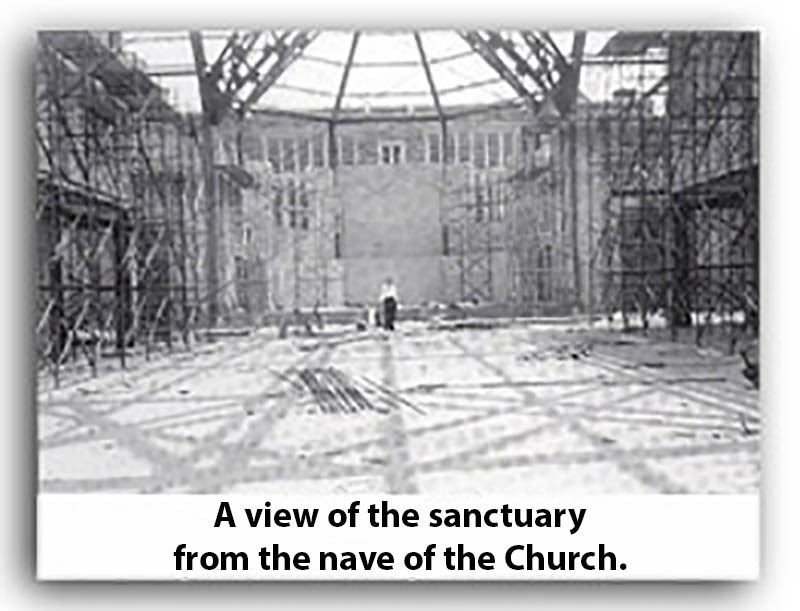 To meet the needs of a growing parish community, ninety-one male volunteers from the parish worked under the direction of two professional builders to add a third floor to Resurrection Church and School during the hot summer of 1939. The volunteers cut $3,000 worth of donated lumber, hammered, nailed, and climbed countless ladders. The work began on July 2 and was completed on September 22 the same year! When it was all finished, the workers had added a 20×14 foot room to each floor by replacing an exterior staircase that ran the height of the building. The addition of a third floor allowed for four more classrooms and a 4000 sq. ft. convent consisting of eight cells (as sister’s quarters were called), a community room, dining room, laundry, kitchen and bath. The new convent could house thirteen sisters. The school was staffed by eight sisters at that time. By 1941 school enrollment had grown to 295 students. On May 8, 1946, Rev. 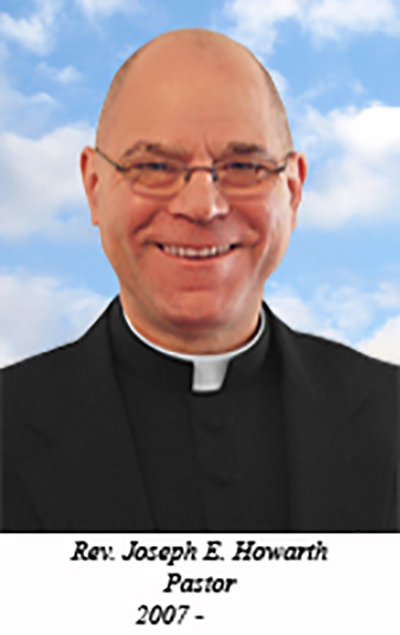 Joseph L. Curran became the fourth pastor of Resurrection of Our Lord parish. He would serve the parish community for the next 25 years and watch the parish grow from 1000 families to 3,300 families, despite 500 families being reassigned to the newly founded parish of Our Lady of Ransom in Mayfair. He would be at the helm of several capital building projects. The new Church was dedicated on October 26, 1958. It is a cross-shaped structure designed in a modern English Gothic style. The Church is constructed of gray Foxcroft stone, hewn in squares and set in random patterns. Limestone trims the windows and entrances, the most intricate of which is the tracery found around the stained glass windows. Over each of the three sets of doors that make up the main entrance are stone carvings depicting symbols of the Holy Trinity: a crowned head (Father), the Agnus Dei (Son) and a dove (Holy Spirit). Additional stone carvings can be found over all of the other entrances to the Church as well. The stained glass windows in the upper Church were imported from France, the largest of which rises over the entrance to the Church and depicts the Resurrection of Christ. Two large intricate rose windows stand at either end of the Church’s transept illuminating the sanctuary. The interior of the upper Church features side altars in honor of the Blessed Mother and St. Joseph. At either end of the transept stand two shrines, one dedicated to the Sacred Hear of Jesus, the other to St. Peregrine. Mosaic Stations of the Cross circumvent the walls of the Church. Both the pews, which seat 1,200, and the confessionals are made of limed oak. Terrazzo floors span the nave and transept of the Church, while Marble lines the walls of the nave and sanctuary. Marble was also used for the altar, the sanctuary floor, and in the construction of a domed-shaped baldachin (canopy) over the altar. The lower Church is comprised of several items brought over from the original Church located in the school building. The original stained glass windows now adorn the lower Church. The Shrine of Our Lady of Happy Delivery found its new home in the lower Church too. 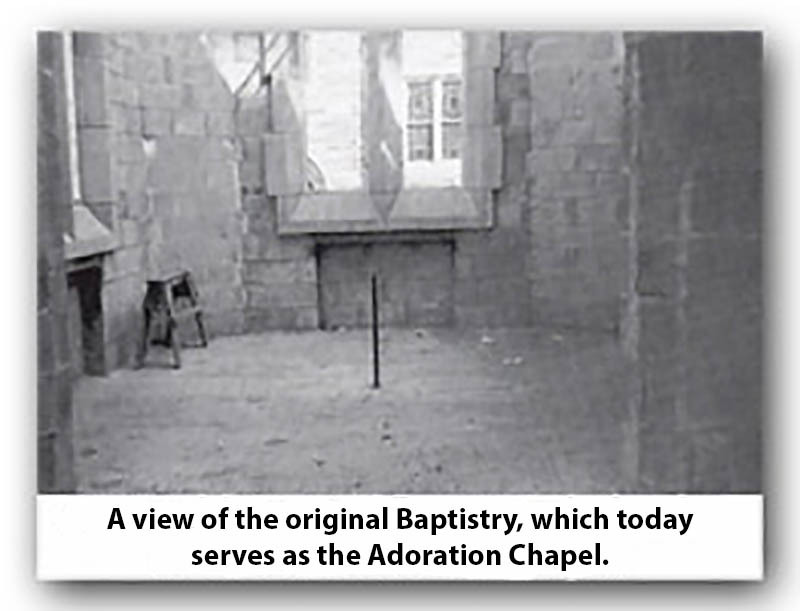 Even the marble found in the lower Church’s altar and surrounding the tabernacle was relocated from the original Church. The lower Church also seats 1,200. Within four years of the dedication of the new Church, ground was broke for a new rectory at 2000 Shelmire Avenue. In addition, a new convent was built at 2035 Vista Street. By the time the new rectory, new convent, and some additional school renovations were finished, the parish debt had increased to $350,000. 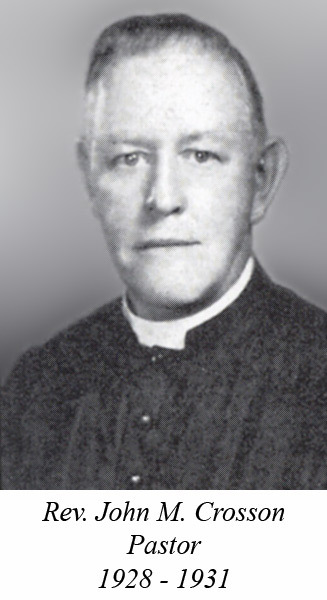 When Father Curran retired in 1970, the debt had been reduced to $100,000. Rev. William J. Sailer was appointed as our fifth pastor on June 4, 1970. 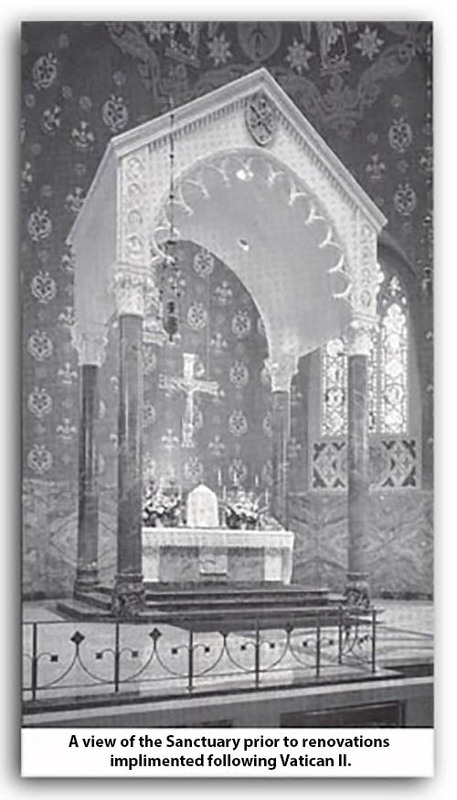 Later that same year the altar in the upper Church was reconfigured in accordance with Vatican II requirements. In June of 1982, the Rev. Thomas J. Calpin is appointed as the parish administrator due to Father Sailer’s battle with ill health. 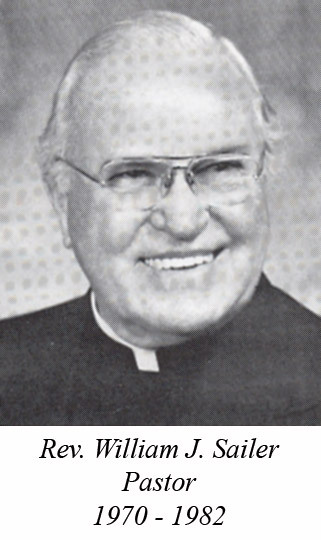 Father Calpin served as administrator for the next 18 months until Monsignor John A. Sharkey was appointed as the sixth pastor of the parish in December 1983. Msgr. 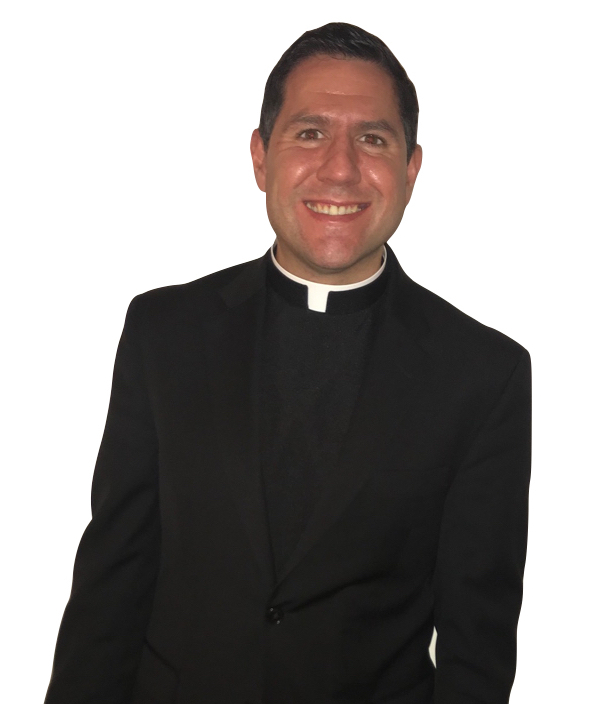 Sharkey over the next six years as pastor, would go on to oversee the restoration of the upper and lower churches, as well as hire the first lay principal for the school, director of religious education, music director, and social services minister for the parish. He also established the Parish Finance Committee. In June the following year, the Sisters of St. Joseph left Resurrection parish at the end of the school year. The Sisters of Notre Dame came to the parish and took up residence in the convent where they remained until the year 2000. Over the next 16 years, these sisters would serve the parish school as well as teach in high schools and colleges throughout the area. They would also minister in many social work capacities including ministering at St. John Neumann Nursing Home in Northeast Philadelphia. On August 27, 1989, Rev. 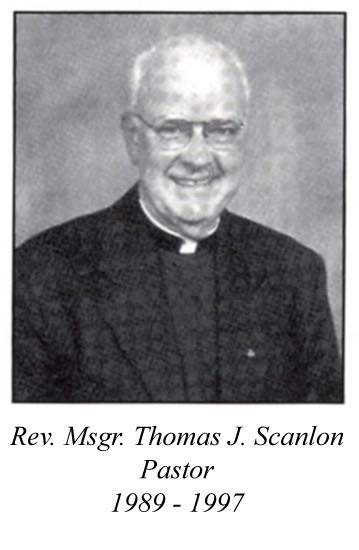 Thomas J. Scanlon was appointed pastor of Resurrection of Our Lord parish. By this time the parish has grown to 12,000 parishioners and 980 students in kindergarten through eighth grade. 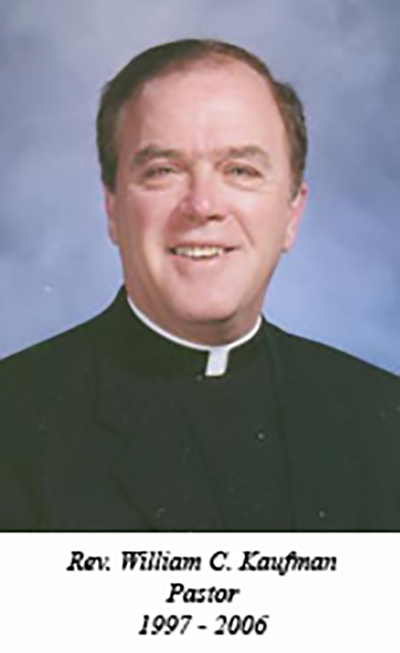 Father Scanlon would be elevated to Monsignor in 1991. In April of 1993, the parish formed its first Pastoral Council composed of 12 members, some elected and some appointed. The council worked with the pastor to provide consultation and feedback on the administration of the parish. Rev. 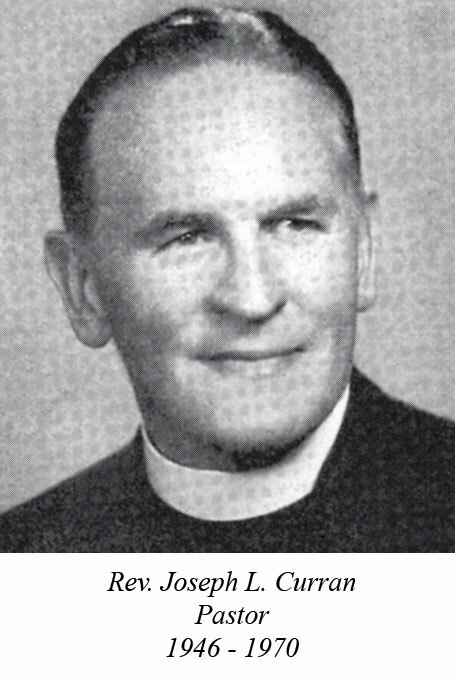 William C. Kaufman became the eighth pastor of Resurrection of Our Lord parish on June 16, 1997. The parish had over 4,500 families at that time. As pastor, Father Kaufman worked to strengthen the bonds between the parish and those in need of special care – the young, the homebound, and parishioners who were sick, bereaved, and dying. As part of those efforts, the parish founded its conference of the St. Vincent de Paul Society in 1997. The group collects donations of clothing, household items, and cash to help parishioners in need. Fr. Kaufman also hired Sister Mary Louise Gallagher, IHM, to lead the ministry to the aged and homebound of the parish, which included monthly visits from pastoral staff members. It was also during this time that the Children’s Liturgy of the Word was established. Father Kaufman was at the helm of the parish’s 75th Jubilee Celebration. The year long celebration opened the weekend of April 13 and 14, 2002. The event featured a show, an orchestra, plenty of food, favors, music makers and one huge Birthday Cake. On May 21, 2002 the parish celebrated with a Night at the Phillies. Then there was the massive parish Block Party held on June 23 that year. Every square inch of the property was in use including the entire 2000 block of Shelmire Avenue itself. The celebrating continued in September with a Parish Homecoming. It was a reunion for everyone who has ever been a part of the parish family. The Homecoming included Mass, a tour of the school as well as a social. More than 1,100 visitors came home for the event. The year long celebration continued with several special masses held throughout the remaining months of our Jubilee Year. They included an Anointing of the Sick Mass in October, a special All Souls Remembrance in November, a Heritage Mass in January the following year followed by a special mass for married couples and the one for the youth celebrated in February and March respectively. The parish closed its year long celebration and festivities with a 75th Anniversary Closing Mass and Banquet on April 27, 2003. In the fall of 2004, Father Kaufman assembled a new pastoral council. The council was chosen via a spiritual discernment process. Its primary mission was to undertake the creation of a comprehensive pastoral plan that would provide a vision for the needs and concerns of the parish community and serve as a “living” document designed to assist the parish community in successfully expressing its mission of spreading the Gospel of Jesus Christ. The council spent the following year working in collaboration with the parish community to create the plan which was ratified by the community in April of 2006. Father Kaufman would continue to lead the parish community for three years more years until his reassignment as pastor of St. Richard Parish in South Philadelphia. Rev. Stephen Leva was appointed as Parochial Administrator on October 21, 2006. He would manage the parish and minister to the spiritual needs of the community for four months until Rev. Joseph E. Howarth was appointed as the ninth pastor of Resurrection of Our Lord in February 2007. He was the pastor from 2007 until 2017. During the last 11 years our parish experienced a lot of updating and became an even more beautiful place to worship and gather. Father Joe Howarth was a caring and thoughtful pastor who really fell in love with the People of the parish. He was gifted with an eye for improving our campus. He had the church commissioned and painted. He had a local artist paint murals and gold leafing around the sanctuary and side walls. There was an improvement fund established to have the entire Church re-pointed. The grounds had hundreds of trees, bushes, and flowers established making our parish campus a garden of paradise here in Northeast Philadelphia. Our school grew and was improved upon as well. Our parish convent lay empty until our local parishioner established a funeral home here on our campus. Visconto Funeral Home now helps our parish greatly by caring for those who have experienced a loss. It has proven to be a great relationship between their family business and our parish. 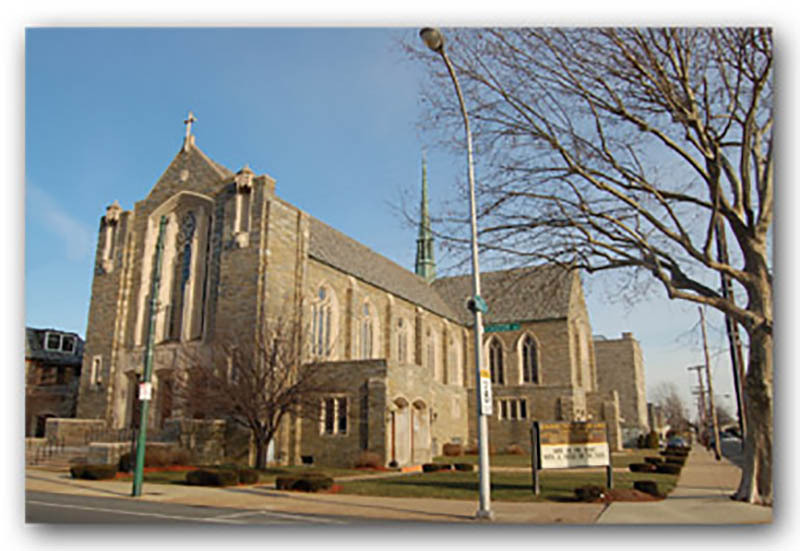 Today Resurrection parish stands as a thriving ethnically diverse Catholic community that continues to meet the spiritual and temporal needs of 3,133 families comprised of 8,619 Catholics living in the Rhawnhurst section of Philadelphia. We are under the guidance and support of our 10th Pastor, Rev. James DeGrassa. Father Jim was installed as our pastor in June of 2017. On this date the parish was merged with Our Lady of Ransom Parish. We now worship as one family here on the campus of Resurrection of Our Lord. The decision of our two parishes merging was a yearlong process. We now combined both parish boundaries together. As a newly merged parish we see great opportunity moving forward. We strive to reach the lost, the lonely, the hurting, the trying and anyone and everyone who seeks more out of this life. Our parish sees awesome days ahead. Now that you read little about our story and our past… won’t you become a part of our bright future? We hope you have enjoyed reading about our story and that you will be a part of our future! 2019 ©Resurrection of Our Lord Parish.